The Crimson Tide stay unbeaten and unchallenged. BATON ROUGE, La. (AP) – Alabama quarterback Tua Tagovailoa looked untethered by the brace on his right knee when he galloped for a 44-yard touchdown. Tigers quarterback Joe Burrow completed 18 of 35 passes for 184 yards. He was sacked five times and had a late pass intercepted in the end zone by linebacker Mack Wilson. Nose guard Quinnen Williams finished with 2 [1/2] sacks. Lineabckers Anfernee Jennings and Christian Miller each had one. Alabama held the Tigers to just 12 yards rushing. Alabama: The best defense Alabama has faced this season wasn’t good enough on its own field to stop the Tide from gashing it for eight plays of 20-plus yards, or from covering a two-touchdown spread by two TDs. “It shows what kind of things we can do against basically anyone,” Tagovailoa said. LSU: The Tigers have had to shuffle their offensive line much of the season, and struggled to match the Tide physically at the point of attack. Guard Garett Brumfield tried to come back for the first time in four games, but struggled and was intermittently replaced by Chasen Hines to start the second half. 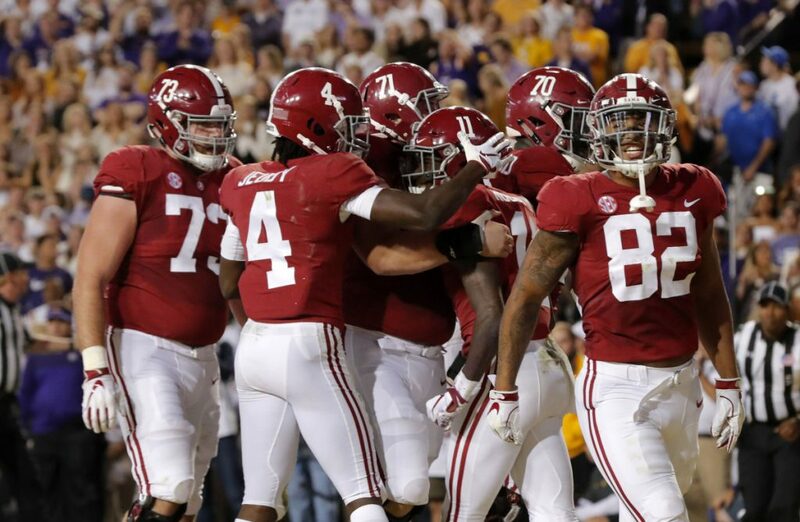 While nothing changes for Alabama, LSU could tumble considerably in the AP Poll after being dominated at home. “I was really, really pleased with the explosive plays we were able to make,” Saban said. The Tiger Stadium crowd erupted, as it appeared the turnover might get LSU to halftime down by no more than nine points, perhaps less, if the Tigers could move the ball. But the Crimson Tide’s response was emphatic. Burrow was sacked inside the 1, and LSU had to punt shortly afterward. Alabama got the ball back on its 46 and Tagovailoa needed just two plays – a 29-yard pass to Jeudy, followed by his scoring strike to Smith – to widen the Tide’s lead.